Welcome to PrimeTime Pickleball, my name is Jordan Briones and in today’s video we just want say Happy New Year and thank you and also at the end of this video I’m gonna tell you the number one way that you can improve your game and take your game to the next level. I don’t want you to miss out on that so stick around and we’ll talk about that. Alright so today’s video is gonna be a little different than what we usually do we just really want to say thank you to all the people who share videos, like our videos and watch our videos. If this is your first time here, welcome to the Primetime Pickleball family, our mission is really to grow the game of pickleball and also to help you through instructional videos to play your best game. Alright so yes it’s a new year, it’s a brand new year, it was a wild year last year. We put out over 80 videos and we’ve been doing this for about a year now we just love the continued support that you guys give to us, all the positive comments and all the feedback how it’s really helped your game. We appreciate it. We’ve had some top players on our videos which has been super helpful and we really want to thank them and also especially thank you guys. So if you’ve been following us for a while now maybe you just know me and or Nicole as just some some really cool people who started the PrimeTime Pickleball Youtube channel. The reason this video is a little different is because we thought it would be cool to kind of show us on more of a personal level so you can kind of get to know us a little bit behind the scenes and just a little bit of what we do and how we really actually make it happen. We both have full-time jobs. I have a family with two small kids and a wonderful wife. I really can’t thank Nicole enough. She’s just a super super awesome person and also just an awesome partner to have. All the videos that you guys see, everything, all the edits, all the emails, the website all that stuff, she handles all of that. She’s just a super awesome partner and a friend and yeah hopefully you guys can get to know us more. We are a Primetime Pickelball Family. We like to call it that…a family. That’s how it feels. All you people that watch us and enjoy our videos, we love it, we just love it and yeah so hopefully today in this video we can show you a few things just of our our daily routines and kind of what we do so.. please enjoy. Here we are this is New Year’s Day 2019, January 1st, we’re here at the Concord pickleball complex. This is the Willow Pass Community Park courts. This is where Katrina and I have held our big Golden State Pickleball Championships tournament you can see there’s 14 courts here in beautiful Concord, California. There’s a basket of balls for drills over there, and a filming setup, got the tripod set up and there’s my partner Danny, so Danny’s been part of our team for a while, he helps us out with a lot of videos and yeah I really appreciate him. We’re here just getting done shooting some film so this is where we shoot most of our videos and yeah I just wanted to show you around and hopefully we can show you a bit more later. okay actually real quick story, maybe something you guys wanted to know is how Nicole and I actually got started, how we got started into making these videos and trying to help more people improve their game. We’re both from Northern California…and again, we’re at the beautiful Willow Pass Community Park courts and this is where my wife and I Katrina run our huge tournament here the Golden State Championships and that’s gonna be at the end of July this coming summer and we hope every summer. Last year we had 500 plus people and we have pros and it was really awesome so we we plan to ramp that up this year but besides the point…back to how Nicole and I met, so I was invited to a pickleball event, a grand opening of pickleball courts in Oakland California to to be part of an exhibition. This is over a year and a half ago, at that time, I had a smaller YouTube or rather my first YouTube channel just teaching some pickleball tutorials and stuff like that. I met Nicole at that event and after hitting with her and meeting her we became friends and we had some coffee and yeah we started just talking about like the things were interested in, if you guys don’t know, Nicole right now is a tennis pro she teaches tennis at the Oakland Hills Tennis Club over there where we met and yeah that’s what she does full-time so we met, we had some coffee and right there is when PrimeTime Pickleball was born. We had similar interests in showing people what we know and what we know works and what can help you improve your game so that’s kind of how it all started, it all started through this pickleball event…oh and at that time, she had only played pickleball a handful of times okay so she’s she played D1 collegiate tennis and she’s been out of the game for a while she didn’t play tournament in tennis in like 10 plus years and she’s been teaching tennis which is her passion is teaching. At that time when I met her she didn’t really play pickleball but as I got to know her that day and she was part of the exhibition as well obviously I could tell by her strokes and her shot selection and just the way she moves her paddle that she was a tennis player so obviously I found that out later and yeah it’s hard to find mixed partners so I was like wow this can be a super awesome person she’s really awesome and she’s super good so yeah we at that point when we started prime-time at the coffee shop we we started training. This was a summer of 2017 and started training for Nationals to play mixed together and unfortunately two weeks before nationals we were playing great I was a 5.0 pickleball player already I was I was playing like you know I think two plus years and she just started to come in and we were drilling for hours, five or six hours twice a week on my days off and getting ready for Nationals two weeks before that her back went out and well now we know that it’s just all the wear and tear from her tennis days and it’s kind of an issue that has been ongoing but right now she’s rehabbing it and it’s getting better and yeah she’s of course met with a lot of different doctors but it’s definitely getting better and we just thank you for all the people who are praying for her and just sending positive words to her because she’s doing really well she’s not on the pickleball courts yet but she will be soon and when she gets on the scene you guys will know because she’s gonna be force. yeah so that’s pretty much our story of how we came to be all right so here I am in the car right now I’m driving through Berkeley California going to Nicole’s house to drop off some footage which she will later edit and make all perfect and great and yeah just gonna go would probably talk about some stuff maybe some future videos that we’re gonna shoot and yeah maybe just grab some dinner or something so yep just headed to her house right now. So you made it to the end of video yes in the beginning of the video I did mention and I promised you that I would share the number one way that you can improve your game and take it to the next level and it is no secret it’s all over our channel and that number one way that’s gonna take you from a beginner player to an intermediate player or an intermediate player to an advanced is drilling and practice determination all those things that go together that in somebody who really wants to improve and get better so I’m a firm believer in that and I practice that it’s not something that I just tell people and throw out there I’m out here drilling. I drill for one to two hours before I even play a game most of the time okay and that can vary depending on what kind of like that could sorry that could vary on the kind of depending on like where you are and where your level is but but definitely drilling repetition is really what’s going to dial those shots in when you talk about serving, returning, hitting your third shot drops or driving and getting up to the non-volley zone, hitting your dinks, deciding on what kind of ball you’re gonna hit and how you’re gonna hit it, where you’re gonna hit it those are all things that come in hitting more balls. If I just came up out here and play like like I said I still have a full-time job I work 50 plus hours a week I only get to play two days a week so my best time for me is I have to be on the court drilling and hitting shot after shot when I when I can because I don’t have that much time. So drilling is the number one way to get you better. Yes it does involve the right mechanics and yes it does involve determination and there’s other ways I can get you better that’s very true playing a lot can make you better if you’re if you just have a mindset of improving and also playing also playing with better players a lot of people say yeah I just need better players to play and get better and that’s that is true to a certain extent you have to be able to hit the shots under pressure and you have to be able to hit shots consistently now this is why a lot of people and this is why you hear a lot of people say consistency is so important than the game a pick ball. If you look at the best players the top of the top players top – your players in the game what separates even them from the average 5.0 player is that they are more consistent yes they might have a few different shots that are comfortable to hit for them but generally the majority of a certain group like if you’re a 4.0 and you play with with a lot of 4.0 generally although all your shots are similar everyone has their favorite shots but what makes you a better player is consistency now those top of the top players they can consistently hit those shots over and over and over again and that’s what gets them over the hump. That’s what gets them on the medal stand every single time ok so if you are 3.0 trying and you want to be a 3.5 by the end of the year or you’re a 3.5 and you want to be a 4.0 or 5.0 by the end of the year whatever your goal is ok this is 2019 it’s a brand new year January 1st whatever your goal is whatever goal you want to reach trying to be whatever level you want to do in pickleball whatever level you want to be you have to put the practice in you have to put the time in and over and over. I always hear that it’s hard to find drilling partners right people don’t like to drill and that’s true that’s true to extent people who don’t want to get better don’t want to drill ok people who don’t really have the knack for for practicing or are or they’re not maybe they’re not determined enough to really get better you know a lot of people just just show up to the courts and they just play games. like literally as soon as they park their car they hop on the court alright zero zero two let’s go. 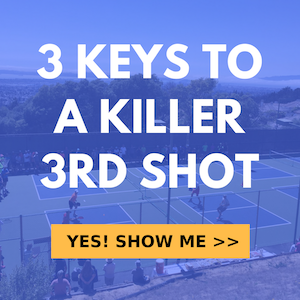 call pickleball right to get to the top a pick ball or even to improve by level you just need to be more consistent shot selection is very important and mechanics are very important but you have to be able to do consistently. That’s the number one thing right you look at any you look at any sport basketball you look at the best of the best right Steph Steph Curry, LeBron James, you look at look at tennis Roger Federer and Djokovic, you look at any sport they’re not just playing scrimmage games and they’re not just just playing games they’re out there in the gym working out and in the gym I mean by shooting free-throws tennis they’re constantly hitting the same forehand different patterns right pickleball you’re getting dinks you’re handing your resets you’re hitting third shot drops you’re coming to the net you’re hitting swinging volleys you’re working on on placement dinking to maybe the backhand side more or moving them around right certain patterns you’re working on something right you’re drilling. In a game you’re only gonna get you know generally you’re gonna get half the balls think about you’re getting 50% of the balls so if I come out here and I’m only playing for about an hour to two hours then think about that right let’s say in that time frame I don’t even know let’s say I hit 200 or 250 balls I go out there with a drilling partner okay in that time I could probably hit double for the balls because you’re not out there serving, changing sides think about it you’re hitting every single ball that goes across that net you are hitting right so you’re getting the repetition double the amount of repetition that you need to improve and you’re doing it in a shorter amount of time and half the time. Right so for those people who say like yeah it’s hard to find drilling partners it is right but you don’t see you don’t need to find a drilling partner you need to find somebody who wants to get better right and then when you find that person say hey this is what’s gonna make us better yes you’re gonna need to play games you know – for the strategy and just games are a little bit different but you’re gonna need to hit the shots consistently and you’re gonna have to hit them over and over and over again that’s how these these top guys have achieved that level they’ve they’ve hit hundreds and thousands of balls right so yeah find somebody that’s number one find somebody who wants to get better find somebody who wants to improve. Now those people they go out here and they just want to have fun and that is totally okay that’s awesome if your new year’s resolution is just to have fun get out of the house and exercise and be healthy that is super awesome but I’m talking about specifically to those people who are actually trying to play tournaments who are trying to beat that person at on the other side of the net you got to get that get out there and drill find somebody that you find somebody that is willing to work with you and you’re gonna drill and work out each other so that you can get better okay thanks for watching again thanks for watching all of our videos we really appreciate it. Happy New Year we really wish that this is the best year that you’ve ever had in 2019 I know that we hope it’s the best year for us and we really extend that to you we hope that you have the best year ever in 2019. Thanks for watching our videos thanks for sharing our videos all you people who comment and send us positive thoughts positive vibes thank you we couldn’t thank you enough, go out there drill practice you know practice with a purpose go out there and practice on something right take something take a weakness take your weaknesses and practice them make them into strengths. Don’t go out there and keep running around your backhand because you know its weak go out there and hit your backhand every time and run a run around your forehand to hit your backhand all right those are the kind of things that push you into a better player if you want to see more videos that on these drills that I’m talking about just click the description below or go to PrimeTimePickleball.com we have we have a lot of videos on there on drills on how to improve your backhand how to improve your third shot how to improve your volleys which are all vital for the game of pickleball so we have a whole bunch of content on there on primetimepickleball.com check it out they’re all free and they’re all awesome so go out there and have a great year everyone happy new year from PrimeTime Pickleball. We hope you have the best one yet.